The NFL Championship game on December 16, 1945 featured a postseason newcomer, the Cleveland Rams, against the Washington Redskins, a team that regularly contended for the title. The Rams had never had a winning season since coming into the league in 1937, but topped the Western Division with a 9-1 record in ’45. Head Coach Adam Walsh implemented the T-formation and had the good fortune of having rookie QB Bob Waterfield (pictured above) to operate it. The first-year player out of UCLA was the league MVP after performing well not only as a passer, but as a defensive back, kicker, and overall team leader. Halfbacks Fred Gehrke and Jim Gillette and FB Don Greenwood fueled the ground attack while end Jim Benton led the NFL with 1067 yards on his 45 catches. The Washington Redskins, coached by Dudley DeGroot, topped the Eastern Division for the fourth time in six seasons with an 8-2 tally. QB Sammy Baugh was well-established as the league’s outstanding passer, having set a record with his 70.3 completion percentage during the season, and there were good receivers led by HB Steve Bagarus. However, Baugh had been injured in the season finale against the Giants and was not at his best. There were 32,178 fans in attendance on a bitterly cold and windy day at Municipal Stadium in Cleveland. The field had been covered with bales of hay in the days leading up to the game, and there were also big piles of snow on the sidelines. The Redskins had the game’s first possession and punted. Cleveland moved the ball well in its initial series as Fred Gehrke ran for a 16-yard gain and Bob Waterfield completed two passes to Jim Benton, who was covered by rookie HB Bob DeFruiter. The second was good for 30 yards to the Washington 15, but the Redskins held the Rams up at their five yard line, with Jim Gillette stopped short on a fourth down play to regain possession. On second down, Sammy Baugh, dropping back into his end zone and feigning a punt, threw a pass that hit the goal post and bounced back. Under the rules at the time, the play was declared a safety and the home team had an early 2-0 lead. Baugh was injured shortly thereafter and returned to play for only a few minutes during the second half. Following an interception by Washington LB Ki Aldrich early in the second quarter, QB Frank Filchock, subbing for Baugh, threw long to Steve Bagarus (pictured at left) for a 38-yard touchdown. Joe Aguirre added the extra point and Washington was ahead by 7-2. With less than four minutes to play in the first half, Waterfield connected with Jim Benton for a 37-yard TD that capped a six-play, 70-yard series in which Gillette had a 19-yard run and Benton caught a pass for 14 yards. Waterfield’s extra point attempt was partially blocked and hit the crossbar, but it bounced over and the Rams took a 9-7 lead. The Rams had another chance with a minute remaining in the first half when LB Pat West intercepted a pass, but Aldrich picked off another Waterfield throw and the score remained unchanged at halftime. 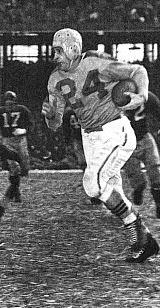 In the first series of the third quarter, Waterfield threw a long, arching pass that Jim Gillette caught for a 44-yard touchdown that concluded an 81-yard series. This time the extra point attempt failed but the Rams were in front by 15-7. Late in the period, a Waterfield punt had the Redskins starting from their five yard line, but they moved effectively down the field. Following a 15-yard carry by DeFruiter, Filchock threw to Bagarus for a 50-yard gain that set up an eight-yard TD pass to wide-open FB Bob Seymour. Aguirre added the point after to make it a one-point contest. Washington had two chances in the fourth quarter, but Aguirre missed field goals from 31 and 44 yards. The first followed a Filchock pass to end Les Dye that gained 44 yards to the Cleveland 31 and three running plays that picked up seven more yards. With time running out, Filchock threw long from deep in his own territory and DB Albie Reisz intercepted to nail down the 15-14 win for the Rams. Cleveland gained more total yards (372 to 214) and led in first downs as well (14 to 8). The Redskins were held to 35 rushing yards on 34 attempts while the Rams were well balanced with 180 yards on the ground and 192 through the air. Cleveland turned the ball over three times, to two suffered by Washington. But the game came down to two plays involving the goal posts, with one leading to a safety and the other a kick that just made it over the crossbar for an extra point. Bob Waterfield completed 14 of 27 passes for 192 yards and two touchdowns, giving up two interceptions, and was excellent with his play-calling and punting, too. Jim Gillette (pictured at right) rushed for 101 yards on 17 carries and also caught two passes for 45 yards and a TD. Jim Benton had 9 catches for 125 yards and a score. Sammy Baugh ended up completing just one of six throws for seven yards. 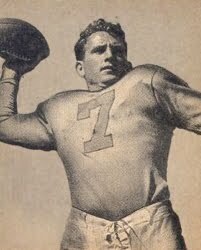 In his place, Frank Filchock was 8-of-14 for 172 yards and two touchdowns as well as two interceptions. Steve Bagarus caught three passes for 95 yards and a TD. HB Merl Condit led the rushers by gaining 18 yards on 9 attempts. The Rams, having lost money despite putting together a championship season, left for Los Angeles the following year and placed second to the Bears with a 6-4-1 record. They next reached the Championship game in 1949. Washington went into a long period of decline, dropping to 5-5-1 in 1946 and not reaching the postseason again until 1971.